Dometic Waeco Flush Installation Frame CR-140-EFM. Fits Dometic WAECO CR-1140 and Dometic WAECO CRX140 CoolMatic built-in RV refrigerator models. The flush frame allows the fridge to sit inside the cabinetry and gives a flush professional finish. Includes all mounting screws required. Frame pieces are all metal construction. Dometic Waeco Standard Installation Frame CR-140-EST. Fits Dometic WAECO CR-1140 and Dometic WAECO CRX140 CoolMatic built-in refrigerator models. The standard frame is a good option for when the depth of the fridge is slightly more than your cupboard depth. The frame gives a smart and professional finish around the fridge perimeter, without gaps. Excellent replacement for three way fridge. More room, always cold and it is quiet. Does not chew too much power. Best upgrade for the caravan. My Generator were great ..best price...fridge packaged properly and arrived safely....fast delivery. Can not fault them. "Great product & Speedy delivery "
Product was exactly as described, works great. Great service, would recommended. I would use supplier again. Does what is designed for. "excellent product, excellent value, excellent service"
Excellent all round, great fridge, exactly as promoted and delivery extremely fast. the my generator sales people answered all my questions straight of the top off there head which gave me confidence that I wasn't dealing with shonky internet shops. The fridge arrived on time and in perfect condition. it was a hassle free purchase. fast n efficient what more could you want. 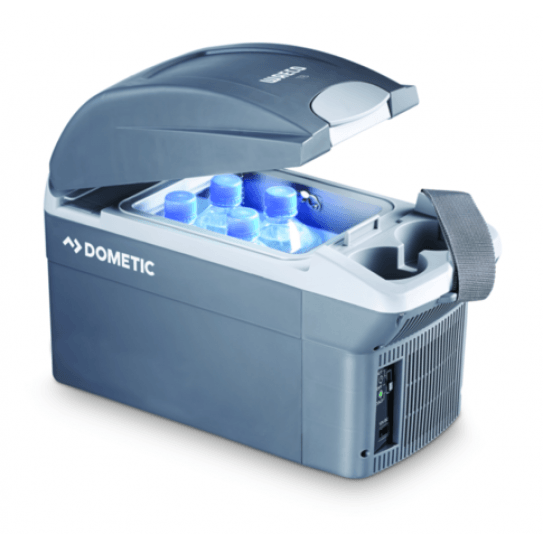 Currently FREE with the Dometic Waeco CRX140 Fridge is a Dometic 8 Litre Vehicle Cooler / Warmer! Dometic WAECO CRX140, CoolMatic built-in 135L refrigerator. A 2-Way Fridge-Freezer for 12 / 24 volts DC and 100-240 volts AC operation, designed for recreational vehicles. This latest CRX140 model replaces the previous Dometic Waeco CR-1140 model. The new CRX range has the same physical dimensions as the previous CR models, but slightly improved performance including; greater temperature control, reduced noise, and better energy efficiency. Full details outlined below. There is no requirement for an extra adaptor to operate the fridge on 240Volts power source. The well-proven Dometic WAECO CoolMatic refrigerator series provide outstanding energy efficient refrigeration for built-in mobile applications such as Caravans, Motorhomes, Houseboats, Yachts and other recreational vehicles. Their operation is reliable even in tilted positions and high ambient temperatures. Brilliant fridge! Replacing the gas fridge we had in our commercial fishing vessel and this model fit with ease and 25litres bigger. The gas fridge was expensive to run and to clean flue was a big job regularly. With a tiny current draw this product is perfect for our needs. Highly recommend !!!! Superb service with live chat and we had product within four days of placing the order. This is a second fridge we have installed for our boat and its perfect so now we have 2. Simple to install, really efficient and works a treat for us in the tropics. The crx140 fitted in the same place as the previous Waeco fridge but the screws in the fridge sides were further back requiring some minor modification to the space. The fridge is more efficient than the previous Waeco. It will require calibration of the temperature setting. Which Dometic have confirmed. Overall an excellent replacement well suited to our needs. The purchase was made online following a phone conversation with the extremely helpful people at Mygenerator. The price was cheaper delivered to us in Katherine, NT than the local people could supply and delivery was prompt. We were kept up to date all the time. Great product, runs nice and quite. No problems, great service and delivery was BRILLIANT. Works a treat. Looks good with the frame supplied. Great service, and after sales support. Great Shipping service. Fits well into the old space. Looks smart. Locking/ opening mechanism difficult especially as the instructions we locked inside the fridge. Freezer size good. Have had 12v/240v before, but our winter trip north starts soon so hoping it will be better and more efficient than the old one. Great company to deal with. Very helpful. Very quick delivery. We were replacing a 3 way fridge in our van it fitted in well with a slight adjustment, and it's looks great . Thank you, working great keeping everything super cold. Everything went to plan on delivery, was impressed when delivered right to our door, this was great as we live on acreage out side town area. Keeps the beers very cold, even for hubby. No worries about over heating and not getting cold like the 3 way fridge we replaced. Very happy with our purchase. Excellent. My email security would not except emails from My Generator and after a phone call they personally ( not computer generated) emailed me to keep me informed about my purchase and delivery time. Very impressed all round about My Generator and their staff. Hello team. We are extremely happy with our Dometic Waceo CRX140 fridge freezer. We have replaced our old 3 way fridge that did not like hot weather. The CRX140 is handling the current heat in South Australia without any problems. We are extremely happy with out CRX 140 Dometic refrigerator We fitted it into our 2003 Jayco Heritage Caravan. We have 270watts of solar panels into a 120ah battery. We are on the road traveling with the current hot weather and our CRX140 is performing perfectly. We also were happy with the quick delivery from your company. Easy to install and fits perfectly into the existing Electrolux 3way fridge spot which has been there for 25 years. Plugged into the existing 240V power point and easy to connect up to the 12V power point. Well insulated as It has just passed its first test of above 39 Deg in the WA heat kept everything cold. Only a small thing I would like to see is deeper door shelf as the two top shelves are only wide enough to hold small blocks of cheese or eggs. Otherwise great fridge. Have been looking for a fridge/freezer for a while now to replace the dead one on my boat. This was not as easy as it sounds as the fridge had to fit in a pre existing recess that could not be adjusted size wise, the CRX140 fit the requirements and as a bonus turned out to been a great fridge function wise, very happy with my purchase. Great to deal with and great pricing, shipping was fast and easy considering I ordered in the silly season I had the fridge delivered very quickly indeed, very happy with My Generator and would recommend them to anyone, great service! Just what i was looking for to replace my old fridge, fitted straight in, more efficient with 30% more space, and performs great. Excellent service when I sent through a question on the product. Delivery within 3 days of placing the order. If I have as good a run with this one as the previous,I will be very happy.Excellent fridge with no issues.Fits like the proverbial same space same size as the original.I suppose if you got it right first time why change. AWESOME no fuss seller.3 days to far north Queensland cant complain about that. I will definatly put this seller on my preferred page.Thank you. Great little compact fridge bigger inside than it looks freezer works a treat and very stylish works great on 12v or 240w and a great price thanks. Very easy website no fuss my purchase arrived in a couple of days no stress. Just what we needed. A great looking fridge. Performs very well. The fridge is great, exactly what we were looking for. It is very spacious and it doesn't weigh much. It doesn't consume a lot of electricity either, we have it running in medium and it is very economic. Very fast, we order the fridge and it was delivered in 2 days. The online purchase was very user friendly, instant reply and acknowledgment of payment delivery was unbelievably quick with no issues. Thank you My Generator. Purchase was easy. Service was great. Shipped quickly and arrived in perfect condition. Can't really fault these guys. From go to wo great all round! Could not be happier with the fridge and service! Great work guys well done! Very happy with the Waeco product. Excellent service form ordering online to the product being here when they they said it would be. Great RV fridge. Good freezer. 300w Solar handles it easily. Highly recommend. I was treated very professionally on my first call to make enquirers. When I decided to buy, the transaction was quick and easy. Item arrived within a couple of days as promised so it was dispatched same day I ordered it. Couldn't fault the service. Would use again if I need to. The Waeco CR1140 works extremely well in Far North Queensland where the 3 way fridges fail. The fridge arrives promptly by a friendly truck driver. It was easy to install although it came without install instructions. The fridge is a great design and fits everything we need in our horse truck. The only problem is the the door locking mechanism seems to be a bit funny. Sometime the fridge wont open without forcing the door to open. That is a shame, as otherwise it is a quality product and I'm sure If I had some instructions perhaps i could adjust it. Q:Does the fridge auto select between 12v/24v? Hi - Yes it does! Q:The manual refers to a red/black cable to connect to the battery. But all I can find is a white/black cable? Yes it is a white/black cable. Simply follow the cable back to the compressor model to see which is labelled as negative and which is positive. For any Waeco technical support simply call 1800 212 121. Q:Hi, what compressor is used in the Waeco CoolMatic CR fridges? Hi Jake; the Waeco CoolMatic CR range of fridges use a Secop compressor. In Summer 2016, Dometic Waeco will release a newer version of these models known as the Waeco CoolMatic CRX range, and these fridges use a Waeco compressor. These newer models are available in the same size, and offer a couple of additional benefits such as removable freezer compartment, slightly reduced noise, and slightly better energy efficiency. Q:Will this fridge tolerate operating in a semi-closed space? E.g. Mounted to the side wall of the cockipit on a boat. Hi, it is advised that there is sufficient ventilation around the refrigerator, especially behind it near the cooling unit. The fridge does not come with mounting brackets. However, there are four screw holes inside the base of the fridge that allows you to fix the fridge to the floor. Q:Are the Waeco CRX Fridges Tropical Rated? Hi there, yes is the answer. The Waeco CoolMatic CRX range is classified as having a Climatic Class of 'T'. Fridges graded 'T' (which stands for Tropical) are designed and rated to work up to 43 degrees C. Thanks. Q:I was told the Waeco CRX has removable freezer compartments- is that correct for all models? Hi Sam, in the CRX range, only the CRX50, CRX65, and the CRX80 models have a removable freezer compartment. Q:Do you need to disconnect the battery if connecting to 240v mains supply? Hi there - No you don't, 240v takes priority. Q:Is the frame (Standard or Flush frame) required as part of installing the CRX fridge? Hi there, the answer is No. The frame is not required as part of the install. The frame is an option to help with presentation within your cabinetry; it tidies up the fridge perimeter in either a flush style or standard style (fridge door sits out proud). So the frame is just an option. The fridge is fixed to your vehicle typically by the screw holes in the floor and there are side screw holes as well. Thanks. Q:Can you confirm which Dometic Waeco CRX models have the LAC (Low Ambient Control) (winter kit) fitted as standard? The CRX product manual states only CRX 110 & 140 models have this fitted. Hi there, the Winter Kit/LAC function is built into the Dometic Waeco CRX110 & CRX140 models only. These two CRX models have a permanent freezer (the 3 smaller CRX models have a removeable freezer). The LAC winter mode ensures optimum operation at ambient temperature of below 16°C. There is no LAC function inbuilt to the CRX80/65/50 models...nor can a 'winter kit' be fitted to these 3 smaller models. The Dometic CRX units are tropical rated fridges, which the specified operating temperature is 18-43°C. They will still maintain a normal fridge compartment temperature when the ambient is lower than 18°C, but will cycle off for longer periods, and depending on stock level the freezer temp may rise...Hint: if the freezer is stocked fully with dense products, then the temp will hold over for longer in the off cycle. Q:Is the price the same for Left Hand hinge? How do I order? Hi, the Dometic Waeco CRX range of upright RV fridges come with variable door mounts & hinges, so they can either be left hand hinge, or right hand hinge. They come delivered right hinged as standard, but you can easily change them over to a left hand hinge. So there is no price difference when it comes to hinge side, it is the same unit and you can choose what side hinge you want to use. Q:We currently have an old Waeco CR model refrigerator in our camper. How is the performance and offering of the newer CRX models in comparison? Our staff use them in their personal RV's and our customers have provided excellent feedback. We would not hesitate in recommending them. Many thanks. Q:At what voltage will the fridge shut down? Q:The manual for the latest CRX models mentions that you need a MPS 35 Rectifier (listed as an accessory) if you plan on connecting to 12v and 240v, is this correct and where are they available from and the cost? Hi James, great question. The latest version of the Dometic CRX Manuals do make reference to an MPS Rectifier as an accessory... which is a little confusing because you definitely do NOT need this rectifier to run any of the Dometic CRX models on AC (240 Volt) mains power. All of the Dometic CRX models can be operated directly on a 12/24V DC or 240V AC power source. The reason it is mentioned in the manual is that it is a universal manual, intended for a world wide audience...and there are some versions of the CRX models sold in other parts of the world (outside Australia) which are slightly different than the models in Australia. In summary; the latest versions of the Dometic Waeco CRX Compressor RV Fridges that we sell here in Australia do NOT need any sort of adaptor or rectifier to be able to run on either DC or AC power. Many thanks. Q:** Dometic Troubleshooting Tip ** - Is the Fuse In the Cable Blown? There is a fuse in the plug of most Dometic fridge cables. The fuse can be accessed by removing the single screw. Replace the fuse (with the same rating as original fuse) and reassemble. This is not a common problem, but it can happen and should be the firwt thing to check.